Choose your color and we can easily match that color in our store. We provide all products capable of getting the job done right the first time. Browse through the catalog and see what’s in our store for you. 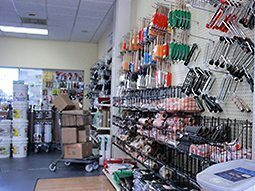 Visit any of our three locations to browse through a wide selection our paint and paint supplies. Custom Paint tinting is a simple process that we provide here at the paint place. Let’s walk through this process together. If there is a special color that you are unable to find, you can bring a small sample of the color or material, we can then examine them, color reference our charts and recreate a color with a custom name for your future reference. In-House Consultation is a stress relieving service here at the Paint Place. A time for you to unwind and for us to dive deep into our customers thoughts. If a customer has a project at hand, we will sit with the client and talk about their ideas and visions while collaborating on their specific venture. Our purpose is to assist and bring those ideas and visions to life, but also making sure they last for a very long time. Teaching our clients about paint, understanding colors and the elements effect on colors is always a pleasure. With numerous features to help your shopping experience. The Paint Place has been offering quality products at affordable prices for more than 20 years! We are the sole distributor of Benjamin Moore and Ricahrds Paints in the Bahamas and we offer a variety of brands of, varnishes, wood treatments, paint brushes and sundries as well as industrial coatings. The Maura family has been a reliable source for contractors dating back more than 50 years. Michael Maura has kept the family name in the business relevant over the years, maintaining the same tradition of quality products at affordable prices. We note considerately the market desire for competitive pricing, quality products and availability. We have three locations; Marsh Harbour, Abaco, Sandyport and Bilney Lane Nassau. Additionally, we have two warehouses fully stocked with inventory as well as our ability to have paint shipments within a ten to fourteen day turnaround. In addition to offering premium products at affordable prices, we deliver outstanding customer service! We also offer group training for maintenance staff and updates on product application catered specifically to your company’s needs. In partnership with our Benjamin Moore International representative we will schedule and respond to your request as needed. When purchasing on a larger scale, your needs may involve consigning paint to you outside of the Bahamas for shipment under the duty free status the project may enjoy. We can consign shipments, delivered to the port of your choice in Florida. Standard architectural products tinted in a specified color will be available in 50 to 240 gallon quantities in pails only. Larger quantities will require lead time of 7-12 days. Drop ship specials require 100 gallon minimum for pre-paid shipping. Thank you for the opportunity and please contact us for all of your painting needs. Simply provide a color and we will do our best to match it.